Taylor's Sweet Little Art and Nerd Site: Taylor's Toy Wednesday's DIY Custom- Big Darkness! 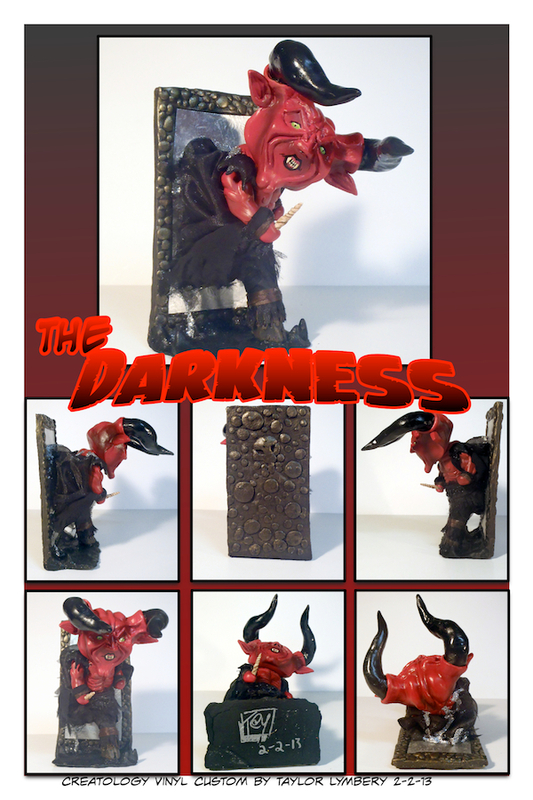 Taylor's Toy Wednesday's DIY Custom- Big Darkness! Big Darkness, or Darkness, or Big D: Whatever you want to call this guy, it should end with awesome! Hands down, this has to be one of my favorite movie villains ever. When I saw the movie, "Legend", as a kid, I was absolutely in love with Tim Curry's make-up as the Dark Lord. It has such a nice mythological appeal to it; it definitely reminds me of a Greek Minotaur. Growing up, two scenes with this character stand out well to me. The first is of him stepping through the mirror to seduce Jack's bride to be, Lili, the second is of him sitting on his throne in blacklight, speaking of the darkness. With that being said, I do have another Darkness to make, hopefully before the next convention. (hint, hint) Now, this custom boasts the scene of him stepping through the mirror. He is made from a Creatology vinyl Devil kit. I used super sculpty and a load of foil to build the horns, face on his head. I also extended his arms, and widened his body using the super sculpty and foil. The mirror, base and legs were sculpted from original sculpty. So far, he is one of my favorite custom toy creations. We'll see if that remains the same when I decide to tackle Meg Mucklebones and Darkness on throne. Now, here's some pics of Big Darkness!